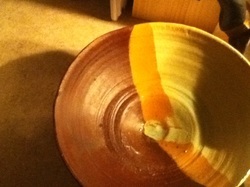 This is a very earthy bowl that pulls together that nice grainy feel with the looks of several grains. This bowl is much more of a décor piece. Great for bringing life to an area. 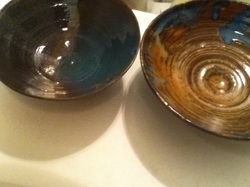 These bowls are part of a set. They have that ideal of the indigo seeping into the darker dip of the bowl. They are really nice, even if just used as decoration. This soup mug has a very wide brim. There is also the contrast of the light and the darkness. 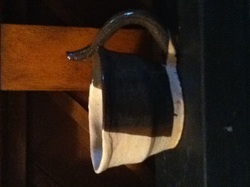 This piece is perfect for eating ice scream or for warm soup broth. This is a cylinder that was made. 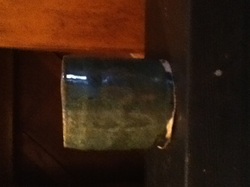 The whole piece is covered in a musty green glaze. The glaze has a very old timey feel to it. 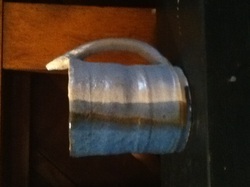 This is a tall mug I made on the wheel. The color changes with the different view angle. The indigo is what steals the show in this piece. This is a slab vase that I created.The main design is made of many earthy textures.The glaze used really compliments the design with its very wood like finish.